2019 marks the 25th anniversary of the NANBF Natural Iowa and we are super excited! The date is set for May 11th, 2019 at Hoyt Sherman Place in Des Moines, Iowa! Come be a part of one of the longest running drug-tested competitions in the country! This is an IPE Pro Qualifier. You can review the 2018 results here. I was hoping to enter this event as a competitor, but the link does not seem to be working. Is registration closed, or has it not been opened yet? Thanks for checking Calvin! The only entry portal has not been opened yet, it should be within the next couple of weeks, we will send out announcements when it is active so stay tuned. Look forward to having you in the 25th annual Natural Iowa! I am trying to apply for my membership card and it won't let me submit the form. This is on the NANBF website. I also tried to send them a message and it said I could not submit it. Thanks for reaching out Chelsea. The NANBF membership site has been down for maintenance, we hope that it is up and running again on 1/14/19. Great question Trevor. Yes, spray tanning services will be available. They will be set up at the host hotel and onsite at the event. Book your spots early to get your preferred appointment time. How do you reserve an appointment for Pro Tan? James, when you enter, you should get an auto-response email with information on how to set up a spray tan appointment. Let us know if you didn't receive it, thanks! I read that we will be polygraphed three days ahead of time???? If I am coming in on Friday night from Mpls, how could that work? I am 60 and want to compete in the over 50. Never did a drug in my life! Hi Mark, Those that are coming in from out-of-town will polygraph on Friday. When you enter, you will be directed to select that day based on your address. It says Wednesday May 3rd is the Registration Cut off, but May 3rd is on Fri. I just wanted to verify the cut off date. Thank you!! Good catch Rikki! It should say Friday, May 3rd, we'll adjust on our end, thanks! I’m competing in Classic Physique Novice. What are the poses for Classic Physique this year? 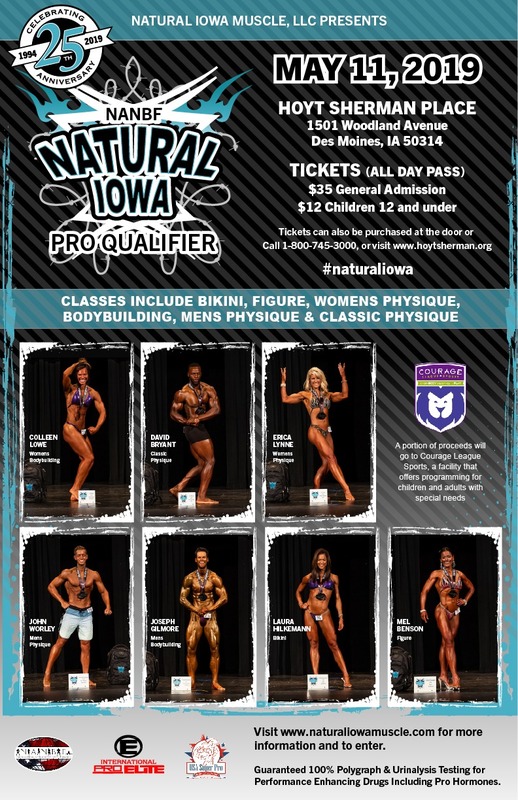 See link here: https://naturaliowamuscle.com/nanbf-classic-physique-criteria-guidelines/ Classic physique competitors should also be prepared to do traditional bodybuilding poses as they are optional poses as well. Hi Ryan, would you please confirm what the host hotel is? I think I heard West Des Moines Marriott, but I noticed the Downtown Marriott is much closer to Hoyt Sherman Place. Would you also please advise on how to book my spray tan? Thank you! Hi Annie! It is the West Des Moines Marriott (their facilities are better suited to handle a bodybuilding competition with check-in, spray tan, polygraphing and after party. There should be a link with your entry confirmation to schedule the tanning. Thanks for reaching out! What are the posing guidelines for physique? Luke, see here for Classic: https://www.nanbf.net/classic-physique Let me know if you are referring to a different category? Just normal physique, will it be 3 qtr turns or just front and back? 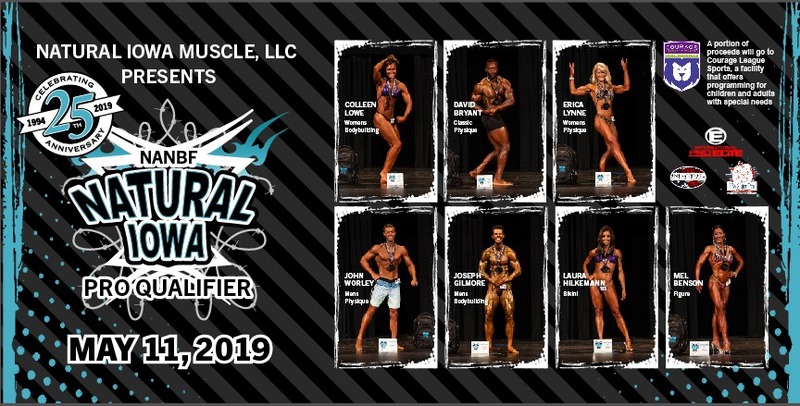 Men's physique will be quarter turns. Let us know if you have any other questions, thanks! On the figure T-Walk is it 2 or 1 pose per spot? I thought it was just one pose for a total of 3 poses but reading on https://www.nanbf.net/figure it's two poses per spot for a total of 6 poses. It also said to not do bodybuilding poses, so just trying to figure out what posing to do so I'm practicing the right thing. Also will you be hosting another posing clinic before this show? I confirmed a polygraph appointment. I decided to compete in a show two weeks before this one. I will STILL BE COMPETING HERE. How do I cancel my polygraph appointment?